Although I was not able to show all the participant's pots here, I hope you can get a sense of the diverse shapes and colors that were created. I hope to have some more photos available soon. Those of you who know me may have noticed that I have been quite busy constructing containers for several upcoming forest/group planting workshops coming up this month. The pieces range in size from 13" to 24" and feature many naturalist features including variations in texture, overall shape and color. Since I have a lot of time invested in the construction of these beauties, which by the way you will not yet find on my website, I thought I would spend a few moments to introduce them here. Rather than showing photographs of each one, which would be way too time consuming with 35 unique, one-of-a-kind pieces, I though I would give some background as too the artistic vein in which they were designed and created. When planning a forest or group planting, an artist should consider several important aspects: which trees to use, which container to select, and what type of overall design to construct. Generally speaking, there are two basic styles that I see represented in the current modern form. The straight trunk design, usually presented in a classical oval container, and the dynamic and moving style formed in a natural rock like slab. Let us consider this quintessential composition by the great master John Naka. Entitled Goshin, this forest planting of Foemina Junipers was started in 1948 and remains in the United States Arboretum as a permanent exhibit. This forest is a beautiful composition presented in a traditional oval shaped container. The forest has a grand static quality, unmoving yet graceful in its own right. 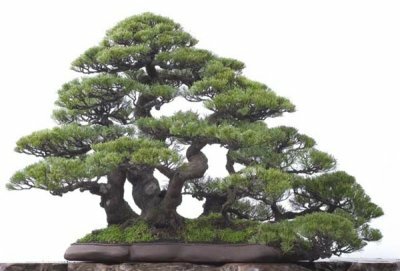 It is a masterpiece reflective of rigidity and strength, yet allows for gentle movement of the foliage among the canopy. Perhaps one could contemplate its two basic directions: upward and outward. Upward movement in the trunks emanating from the collective base, and outward movement in the graceful flow of foliage from the open canopy. I think the container is proportional for this group. It works well with the strong columnar like trunks. Like the trees the pot is straight; this blends with the trunks. The pot's depth is almost the same as the collective trunks thickness and that too helps unify the container to the forest. There is also a harmony in the tree trunks presented by the negative spaces that exist between them. A final observation of this composition warrants a glance to the spread of the canopy and the containers width. Once again we have a sense of balance. 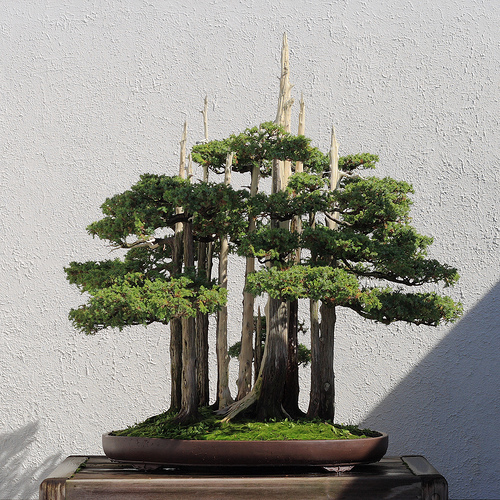 The right and left first branches spread out past the pot, but just enough to give visual weight up to the canopy. It does not take away from the base and soil line, which could alter its proportions a bit. The canopy also features a lovely jin, which was intentionally placed off center right in the composition. Notice how its placement coincides nicely with the right side of the foliage. It overhangs the pot a bit more than the left. This was intentionally done to help balance out the overall composition. Like the masterpiece above, forests can also be done quite effectively with the use of a more naturalistic slabs. 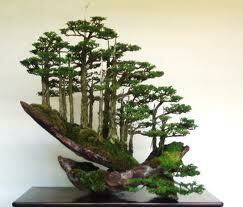 In choosing one, a bonsai artist should take into consideration ways to bring harmony to the composition. Consider line, thickness of trunks, movement of subjects, negative space, and overall style. Take a look at natural rock slabs and see where to highlight certain features such as depressions or outcroppings. Save uncovered edges or margins in the slab to help frame the composition. This will help to harmonize the trees to their environment. 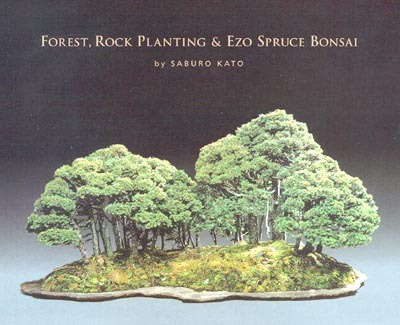 Credits: (top and above right) Robert Stevens, (top left) unknown, (above) book cover by Sabuto Kato, forest artist unknown. I hope you have enjoyed this brief presentation. I look forward to any questions or comments you may have. Hope to see you at Joy of Bonsai in Bunnell! Here is a couple of shots of a chawan tea bowl that I recently made for my wife. I used a combination of some nice glazes and I think they turned out nice. I think I should use more of this color on some kusamono or shitakusa bonsai pieces too. I love to experiment with glazes over and under each other. It can be great if the overlay does what it is supposed to, but we must keep testing and retesting and hoping for just the right effect. Here is an example of a glaze combination that I have spent the better part of 2 months trying to recreate. It is actually two glazes from the Mastering Cone 6 Glazes book. I combined Carribean Sea Green under a coat of Clear Powder Blue (I left out the Zircopax, an opacifier). The lovely specs are from iron in the clay. I can't wait to use this on some more bonsai pottery. With just a few weeks to go before the 2011 Joy of Bonsai mini convention I wanted to share some photographs of my glazed colored slabs that will be available for purchase. Although these are not ALL of my slab pieces you can get an idea of the type and size of some of them. I have about 35 pieces in all ranging in many colors, sizes and textures. The unglazed types (not pictured here) range from reddish browns to mauve and red tones, all stained to give them a unique character. This piece below was a commission that will be used as a demo for Mike Rogers in KAWA. He will be using it for a forest of Hornbeam or Crepe Myrtle. Mike is wonderful at creating a beautiful group planting with just about any material. I was very humbled to have made this slab for his demo at this years' event in Bunnell. 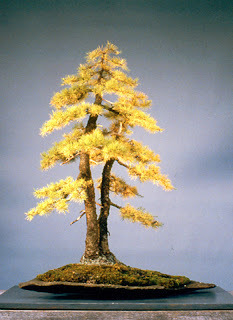 Later this week I will post an short article about the group/forest planting as it relates to the style of container. I am hoping to shed some light on the different STYLES of plantings and how a good container, pot or slab helps to effectively complete a well balanced composition. Until then, enjoy your new year!